MICHELHAM PRIORY: Christmas in the Courtyard today, Friday. Victorian Christmas at the Priory, December 8 and 9. Michelham Priory, 01323 844224. CABARET: Oh What a Lovely Dicker Cabaret, December 7 and 8, 7.45pm at Hailsham Pavilion. Tickets £12 from the Box Office 01323 841414 or www.hailshampavilion.co.uk Roll up, roll up, get your Lovely Cabaret tickets. The Dicker Players have been performing their ever-popular annual Dicker Cabaret at different venues for over 40 years and are delighted to return to the wonderful Hailsham Pavilion for the fourth year running. All seats are £12 and this year £2 from every ticket sold will be donated to the Royal British Legion. The evening contains sketches, comedy routines and songs with live music and a special 10 minute ‘disastrous’ play. To mark the centenary of the end of the First World War, there will be a wartime theme in the second half of the show. Bring your singing voices and be prepared to join in with the songs and, if you want to enter into the spirit of the evening, feel free to dress up appropriately or bring a Union Jack to wave! But, be warned, some of the material is of an adult nature, which might cause offence and the show is not suitable for children. Comments from audiences at past sold-out Dicker Players productions: ‘Absolutely brilliant. Not laughed so much in a long while’; ‘Brilliant show. Loved it....sooooo funny’; ‘Great work everyone. Such a laugh. Delighted to see it, the best Dicker show yet’, ‘Amazing show guys, absolutely love it’; ‘Fantastic show, hilarious. Well done, we really enjoyed it’. The perfect pre-Christmas treat for you, your family, friends or work colleagues. Dicker Players website www.dickerplayers.co.uk. CHRISTMAS FAIR: Friends of Firle School Christmas Fair tomorrow, Saturday, 11.30am to 2pm at Firle School. Free entry. CAROLS: Christmas Carols in the Bar on Sunday at The Old Oak Inn, Arlington. CAROLS ON THE GREEN: By Dicker Village Shop, Monday, 6pm to 7.30pm. LUNCH CLUB: Cuckmere Valley Lunch Club meet on Tuesday, 12.45pm in Alciston and Selmeston Village Hall, T: 871299/870072. For residents of the downland villages. 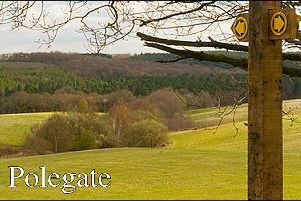 WI: Firle and Beddingham WI meet on Wednesday, 7.30pm in Firle Memorial Hall. BINGO: Bingo Evening, Friday December 14, 7.30pm in Berwick Village Hall. CHRISTMAS TREES: On sale at The Old Oak Inn, Arlington, 8am to 8pm.